Thank you to my friends over at Tessemae’s for sponsoring this post. Shop online and enter FoodConfidence at checkout to get 10% off your order! Salad dressing is a huge part of my life; it’s something I consume almost every day. Over the years I’ve become pretty good at whipping up a quick and tasty dressing at home, but I also like to have a few delicious store-bought brands on hand. This is not an easy task. Decent store-bought salad dressing is hard to find. What I look for is pretty simple. It’s what I recommend to my private clients, Nourishparticipants, and now to you: read the ingredient list and ask yourself, would I use these same ingredients at home? Sounds easy enough, right? Ha, not so fast. The problem is that many so-called “natural” brands don’t even use olive oil, much less cold-pressed olive oil, which for me is a salad dressing must-have. Most of the larger, less expensive brands contain ingredients I would never use at home: corn starch and corn syrup, MSG, soybean oil, and artificial colors like red 40. It’s frustrating, to say the least. The good news is that there are quality salad dressings out there, you just have to find them. When Tessemae’s asked me to review their salad dressing, I was intrigued and just a little pessimistic. Before saying yes, I did my due diligence. I went online and checked out the company and the ingredients. Much to my surprise I discovered that these folks are actually the real deal! Tessemae’s is a local Washington, DC area company. It was founded by the son of a health-conscious Annapolis mom named Tesse. Tesse used this very same salad dressing throughout their childhood in order to get her family to eat their vegetables. I just love this story. It’s great to support a family-run business that is passionate about offering a better choice for consumers. So what did I make with Tessemae’s salad dressing? I had a bag of red potatoes that needed cooking so I decided to go with something different. This Asian style potato salad came out absolutely delicious (and took less than 10 minutes to make from start to finish). 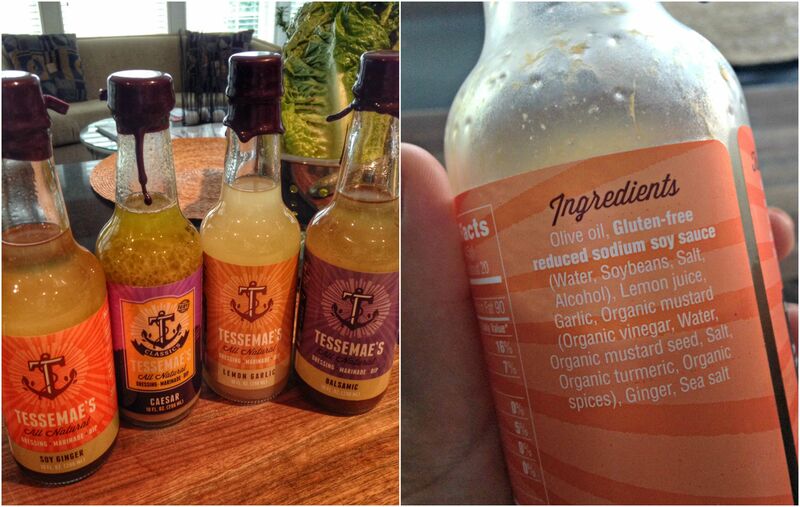 Tessemae’s sent me a few bottles of dressing to test and I really liked them all, they taste very much like homemade. But what I love most is the ingredients…everything I would find in my own kitchen: quality olive oil, fresh lemon, real vinegar, herbs and spices — and no corn syrup! 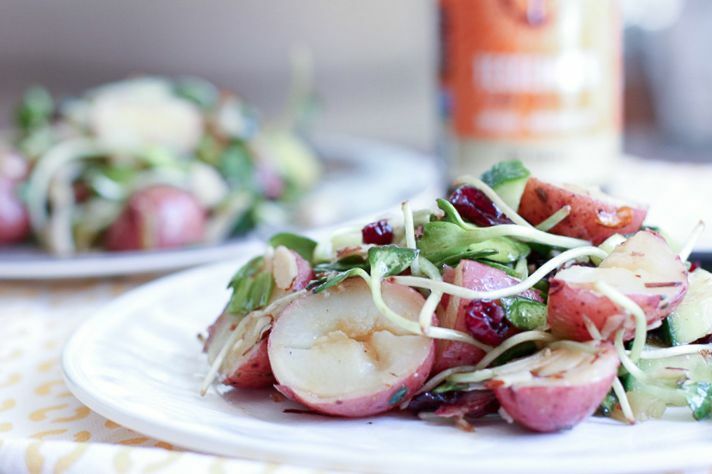 For this potato salad I used the Ginger Soy dressing. I absolutely LOVE the lemon garlic dressing, too. I could have gone with either one! I have to tell you how awesome this potato salad is! My husband ate the entire bowl standing at the kitchen sink. 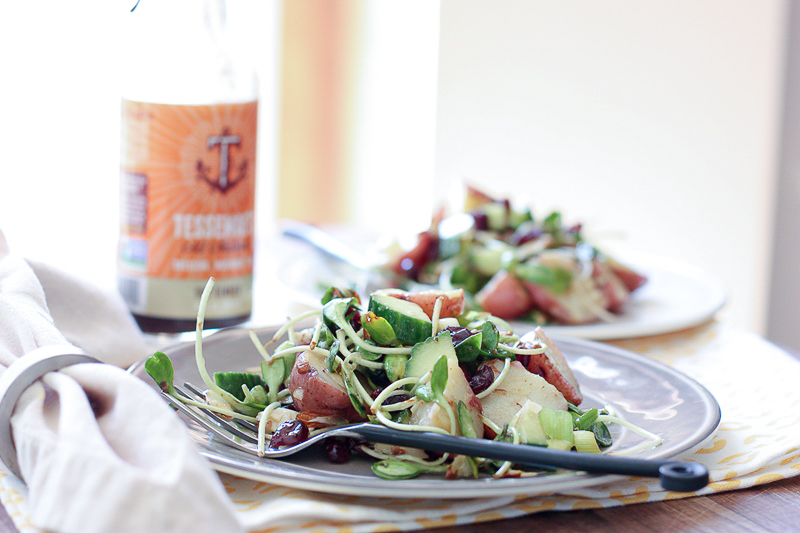 The soy ginger dressing is the perfect Asian flavor — super refreshing and a little unexpected. Oh, and here’s a little tip: when storing the salad dressing in the fridge, it may turn cloudy. This is totally normal. To loosen it up, just place the bottle in a warm cup of water and let it sit while your chopping up your salad veggies (about 3 – 5 minutes). Once it’s loosened up a bit you’re set to shake it up and pour on your dish! 1. Boil potatoes in salted water until just tender. Let Cool. Slice into bite-sized pieces. 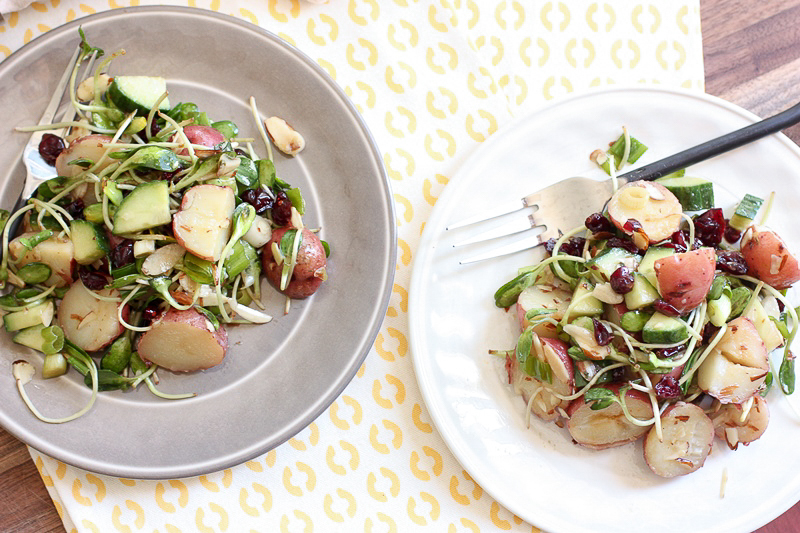 In a large bowl add the potatoes, cucumbers, scallions, cranberries, greens, and almonds. Toss gently with dressing. Season with salt, to taste. Serve cold!